During my undergrad, I took an entire online course in a Starbucks sitting area. After graduating, I took up astrology and bought and read several books on the subject in my favorite cafe. I studied for my GREs there and used it as a meeting place for several social engagements. Now, it seems I go for the sole purpose of this blog. Sometimes I’m able to squeeze in some work — or heaven forbid, read a book — but mostly I’m scoping out the place/neighborhood. If this sounds like a complaint, it’s because it is. Luckily, I still have plenty of time to change my way and go back to why I fell in love with Starbucks in the first place. 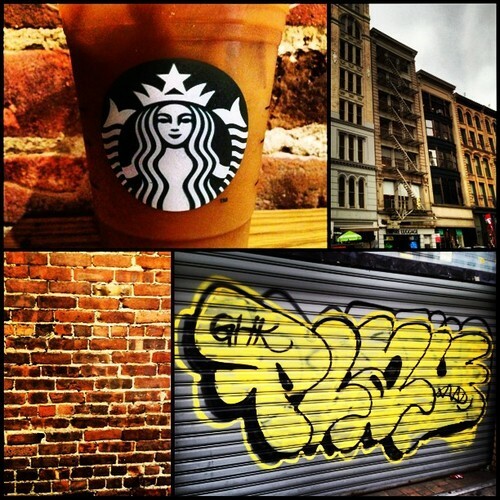 The Starbucks I’m currently occupying is just south of Canal Street in a cross-section of Chinatown and TriBeCa; although characteristically, this neighborhood (and the Starbucks within) resembles SoHo much more than TriBeCa. On the outside, the Starbucks on Walker and Broadway is covered in construction sheeting and swarming with crowds. On this inside, it is still pretty much swarming with crowds but much more visually appealing. Although dimly lit, this Starbucks has its perks, like exposed brick walls, tons of seating, and plenty of power outlets available for power hungry New Yorkers. Thankfully, this Starbucks is quite large because there are plenty of tourists beating down the door — even though most seem to come just to use the restroom. 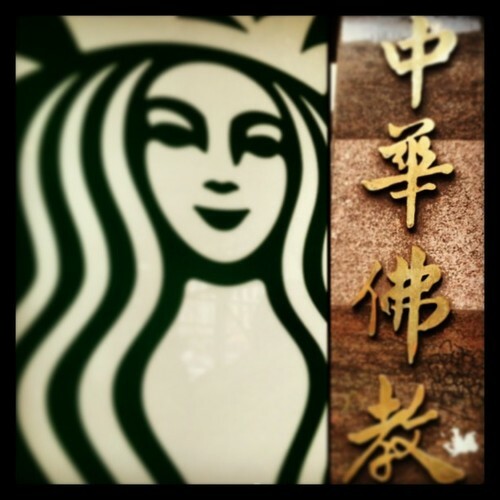 Today I thought I would have a pleasant visit to the Starbucks in Chinatown — I was only half right. I made it there fine, but found the Starbucks to be anything but pleasant. But before I get into the gory details, let us first examine this unique neighborhood. Chinatown contains the largest ethnic Chinese population outside of Asia. Walking through this neighborhood, one can easily imagine they are walking through a busy street in China. The billboards and storefronts are written in Mandarin, and odd looking meats and fishes hang in store front windows. This particular location is on the corner of Canal and Centre — and if you’re thinking Canal Street sounds familiar, just think counterfeit Rolex and fake Gucci. That’s right! Canal Street –once an actual canal — is now infamous for its backroom shops brimming with knockoffs of electronics and handbags. So needless to say, this neighborhood attracts a crowd that rivals Times Square. This Starbucks is like a mosh pit in purgatory. I walked in and all I could see was a mass of standing people with no discernible lines – just random shuffling. Now don’t get me wrong, I’ve had my fair share of mosh pits in my younger days but I’d prefer them a part from my Starbucks visits. By examining who already had drinks in their hands, I was able to find the beginning of the line and there I stood — swaying lightly with the crowd. While I stood waiting in the line I was able to take in a few key facts. There are so few chairs that people are literally huddled together in groups — either waiting for a seat to open up or having given up completely and resigned to standing. There was no restroom available — I don’t think the small space could have held the extra bodies that a public restroom would have brought anyway. And the two entrances on opposing walls kept the temperature nice and chilly — so chilly that I’m actually regretting ordering my iced beverage. After 10 minutes of standing in place — adamant about writing this blog entry on site — I was able to score a seat lining the window. And unfortunately this tight environment isn’t conducive to any kind of reading, writing, or thinking. My only recommendation for this location is to go very early in the morning or late-late night. Perhaps the crowd will be less intense.